Crunchy, tasty and handy, this on the go snack is famous for pampering your taste buds with flavourful bites. Add in layers of cheese to make it extra yummy. 1 Marinate chicken with 1 tbsp of Knorr Chef’s Chicken Masala for 30 to 60 minutes. 2 Heat oil in pan, add minced chicken and cook well. 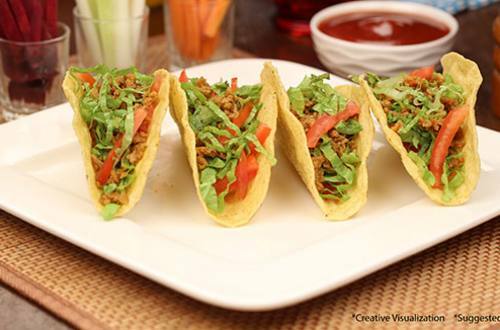 3 Take a taco shell, add a portion of the chopped tomatoes, onion and shredded lettuce. 4 Add the minced chicken, Kissan ketchup and remaining chopped tomatoes, onion and shredded lettuce. Another version of Chicken Napolitiane which is very popular in Italian food. Fresh mushrooms and juicy chicken cooked together to bring out a delicious flavour. Crispy potato wedges dipped in a hot chicken soup. A soup to enjoy at anytime.